SPEECH OF THE PRESIDENT OF THE SOCIETY OF PREVENTIVE PSYCHIATRY PROFESSOR GEORGE CHRISTODOULOU ON "WOMEN AND BIO-PSYCHO-SOCIAL STATUS" ON WEDNESDAY 6 MARCH 2019 AT 18:00 AT STOA TOU VIVLIOU. | SOCIETY OF PREVENTIVE PSYCHIATRY - WFMH, WASP MEMBER AND WPA AFFILIATE MEMBER. ΕΤΑΙΡΕΙΑ ΠΡΟΛΗΠΤΙΚΗΣ ΨΥΧΙΑΤΡΙΚΗΣ - WFMH, WASP ΜΕΛΟΣ ΚΑΙ WPA ΣΥΝΔΕΔΕΜΕΝΟ ΜΕΛΟΣ. 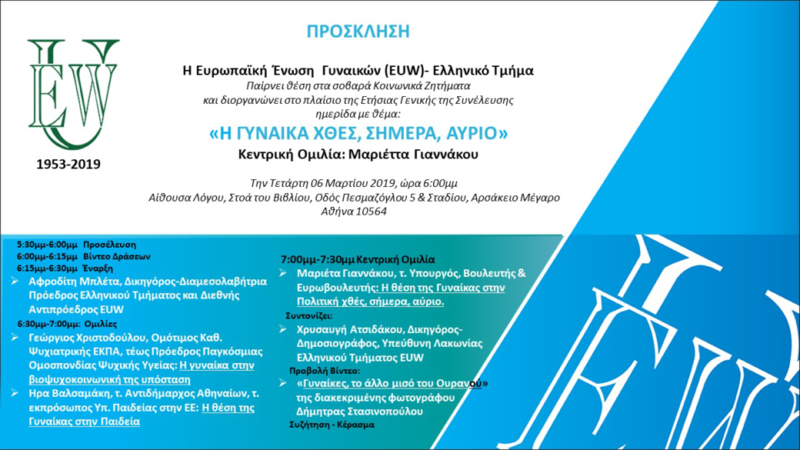 The speech will take place at the annual general meeting and one day meeting of the Hellenic Section of the European Union of Women (EUW) on the topic “WOMEN YESTERDAY, TODAY, TOMORROW” on Wednesday 6 March 2019 at 18:00 at the Speech Hall, Stoa tou Vivliou, 5 Pesmazoglou & Stadiou Street, Arsakeio Megaron, Athens 105 64. The meeting will include a keynote address by Mrs Marietta Giannakou, former MP, MP and MEP on “THE POSITION OF WOMEN IN POLITICS YESTERDAY, TODAY, TOMORROW”, along with speeches by Mrs. Hera Valsamaki, former Deputy Mayor of Athens, former Representative of the Ministry of Education in the EU on “THE POSITION OF WOMEN IN EDUCATION” and by the President of the Society of Preventive Psychiatry Professor George Christodoulou.